ACTE’s 25,000 members—teachers, guidance counselors, middle school and high school administrators, postsecondary and technical educators—are involved in planning and conducting career and technical education programs that prepare millions of students entering or re-entering the job market. 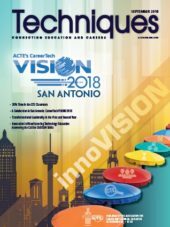 Eight times a year, they all receive Techniques Magazine, the most widely read, most trusted and most informative publication serving the career and technical education market. Take advantage of ACTE advertising opportunities and reach our members and VISION 2019 attendees before, during and after the event! Techniques 2018-2019 Media Kit for advertising rates and issue dates. If you're interested in writing for Techniques or the 2019-2020 editorial calendar. Reserve Techniques and VISION 2019 Advertising Today! Pre and post VISION and ACTE membership postal mailing lists can be purchased from Infocus Marketing, Inc. (800.708.5478 or www.infocusmarketing.com). 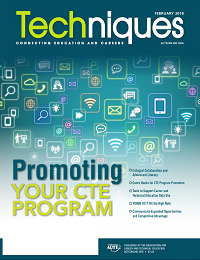 Eight times a year all 25,000 ACTE members receive Techniques Magazine. Your full-page advertisement will be included in eight consecutive issues. You can also provide a one-page advertorial in a predetermined issue. You will have a 250 pixel wide by 125 high banner on the VISION website. You will have a banner in the VISION program app. Not ready for a full-page commitment? Start out with half-page horizontal advertisement in eight consecutive Techniques issues. Plus have a 250 pixel wide by 125 high banner on the VISION website.